Microsoft Kinect is an exclusive controller-free motion sensor add-on peripheral for Xbox 360 that allows users to play the games using own body, literally, without any controller. Though Kinect is currently designed for Xbox 360, Microsoft has plan to link Kinect for use on next version of Windows operating system, rumored to be Windows 8, but hackers who can’t wait have managed to hack the Kinect and developed open source device driver with SDK or API for Kinect. The device driver for Kinect, a low-level hardware-dependent and operating-system-specific software that acts as a translator between a hardware device and the applications or operating systems that use it, allows Kinect to be installed as a device and interact with higher level computer programs. As such, Kinect can be used on PCs and other devices to take advantage of the color and depth (RGB-D) sensing camera, accelerometer and microphones on Kinect, or control the rotating and tilting motor. The benefits are wide, as Kinect can potentially applies to areas such as robotics, virtual multi-touch, HCI, educational, surveillance, motion capture, people or object tracing, 3D video capturing or scanning and etc. The open source Kinect device driver is now been published as OpenKinect or libfreenect, first developed by Hector Martin. Actually, the first video demo of Kinect working on Windows 7 was published by NUI Group (AlexP), which has also published separate Windows Kinect driver as CL NUI Platform. OpenKinect drivers include all code necessary to activate, initialize, and communicate data with the Kinect hardware. OpenKinect is cross-platform and run on Windows, Linux, and OS X. The drivers will expose an API for C/C++ and managed code (C#). Download OpenKinect drivers pre-compiled binary for Linux, Windows (both x86 32-bit and x64 64-bit version)and Mac OS X platform from openkinect.org and source code from github.com. OpenKinect (libfreenect) unofficial port with pre-compiled binaries for Mac OS X and Windows is also available from here. CL NUI Platform consists of an SDK, API and a stable driver for Microsoft Kinect hardware (Xbox NUI Audio, NUI Camera, NUI Motor and Accelerometer) devices on Windows machines. It also comes with a sample WPF application – CL NUI Device Test, which allows users to control the cameras, move up or down the motor or accelerometer and change the color of LED. Download CL NUI Platform installer from codelaboratories.com and the overview. 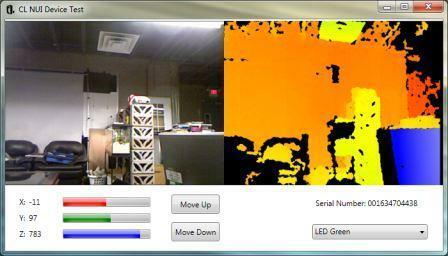 Video demonstrating Kinect NUI Motor device controlled from Window 7 with real time accelerometer data displayed.